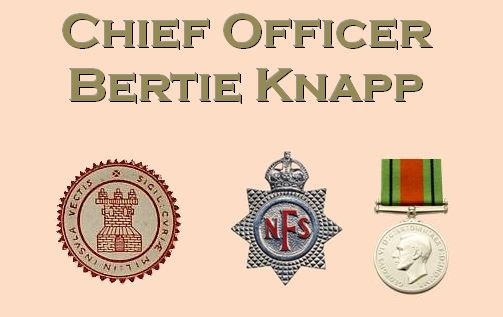 Bertie Knapp, former Chief Officer of East Cowes Fire Brigade passed away on 2 October 1964 aged 77. Bertie was born in East Cowes in 1878 the son of Jacob, a gardener, and Ellen and spent most of his younger years in the family home at Marsh Road. By 1911, now 23 years old, he was married to Louisa Beatrice and living at 18 St David's Road. He earned his living as a driller in the boiler shop at J.S. White's. In the same year he was first appointed to East Cowes Fire Brigade, by then still a young brigade but already sporting an impressive steam fire-engine. His initial service as a call-boy was soon superceded by evolution to the status of fireman and by the early 1920's he was appointed the brigade's Second Officer. In that role Bertie often seconded for his various Chief Officer's at IWFBF meetings when the Federation was reinvigorated by Newport's Chief Officer Mursell in 1924. In the course of these meetings he emerges as a man keen to ensure the Federation's fund for death, injury and dependents is kept regularly topped up. During the course of his service he attended two catastrophic fires at his employers premises in addition to that of Groves and Guttridge. In his spare time he was the respected goalkeeper for East Cowes Vics and spent considerable energies as churchwarden, sidesman and verger at St James's. When Chief Officer Frank Goff stated his intention to retire from the brigade on 31 March 1939, Bertie was immediately appointed Chief Officer-elect and fulfilled the role until the formation of the National Fire Service in August 1941. He retained his senior status in the town within the NFS but poor health forced him to retire soon after. However his association with the fire service didn't end and for many years until his death he was a key element in the station's social and charitable endeavours. He also featured as a key figure in the battle to save East Cowes Fire Station. Shortly after the establishment of the IW County Fire Brigade the County Council formed a Fire Brigade sub-committee to oversee its administration. By the end of 1948 they agreed that East Cowes Fire Station should be closed and the date was set for September 1949. The collective effort of the town's population coupled to local business and dignitaries took the case direct to the Home Office who overturned the IWCC's plan and thanks to Bertie and his cohorts East Cowes Fire Station was saved. Bertie passed away at St Mary's Hospital, he had outlived his wife by three years, she having died shortly after the couple celebrated their Golden Wedding Anniversary. Rest in peace Chief Officer Knapp.